The first documentary mention of Arnstadt was on 01 May 704, as the Duke Hedan ii. donated the settlement Arnestati Bishop Willibrord von Utrecht. Realm history was written in Arnstadt, when King Otto i. has hold an imperial assembly for the settlement of the "Liudolfinian Rebellion " on 17 December 954. Arnstadt received the municipal law from the monastery Hersfeld in 1266. The "Walpurgis Monastery" was foundet on a range of hills about 1100 - its foundation walls were excavated in last time. Later it was shifted into the town. The "Franciscan Monastery" was based in 1246. Martin Luther stayed briefly in the "Franciscan Monastery" of Arnstadt in 1506. Both monasteries were removed after the reformation. The Bach family shaped completely particularly the history of Arnstadt, altogether 17 members were born in Arnstadt. Johann Sebastian Bach was undoubted one of the most outstanding individualities, who have ever been lived in Arnstadt. Arnstadt was his effect place from 1703 to 1707. In this time was he actively as organist in the "Neue Kirche". 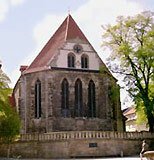 Later named after "Johann-Sebastian Bach" in "Bachkirche". The "Bach memorial place" in the recently closed "House with the Palmtree" and the Bach Monument on the market square is dedicated to him. the lithograph A. Paul Weber (1893-1980) creator innumerably works of the forming art, of signatures and the industrial design - his works finds the interested one in the Weber-Museum on the cathedral island in Ratzeburg. 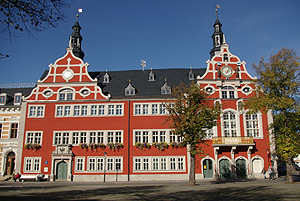 The town hall of Arnstadt, was built in the years 1583-1585 after the big fire of 1581. The former town hall and 378 houses felt to victim the flames. The old town hall was built in 1501. It was destroyed during a big fire in 1459. The Princess Auguste Dorothee (1666-1751) gave the works in job for the wax figure collection "Mon Plaisir" during her regency from 1691 to 1751. About 82 scenes with 400 dolls gives a detail-faithful image of the week-day at that time, it is the largest collection of historical dolls houses in the world. The voluminous and beautiful collection is situated in the "Castle Museum New Palace". The gate "Riedtor" as the southern passage in the former town wall is one of the parts, they have outlasted the times. In its direct proximity was the "Günthersmühle", which was former one of the largest mills in Germany. Nevertheless already held in 14th century the town wall numerous sieges by hostile successfully was to troops.